Here’s what happened. I was in the middle of baking cookies, and couldn’t decide if I liked the rough shape or the smooth shape. I made a tray with half of each, figuring I would decide how they looked baked. They came out of the oven, and I still wasn’t sure. So I took a picture, and I tweeted it, asking people which they liked better. I was amazed at the number of people who responded to my 1 am tweet. And that’s not nearly all. 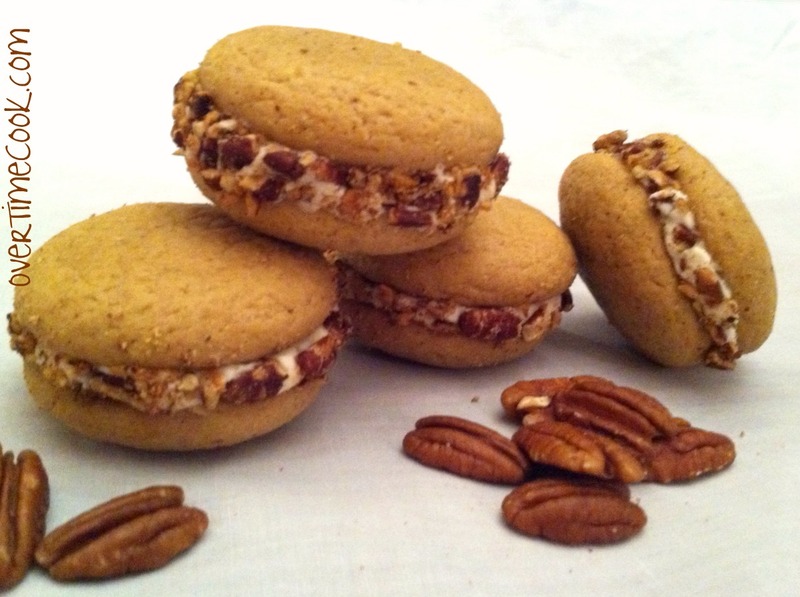 After I settled on smooth looking cookies, further conversations led these to become sandwich cookies, and then the suggestion of the night came from Big Fat Baker, who suggested I roll the sandwiches in chopped toasted pecans. Did I lose you somewhere in the twitter talk? Let’s sum it up. These cookies are delicious. Their delicious maple flavor is perfect for fall. 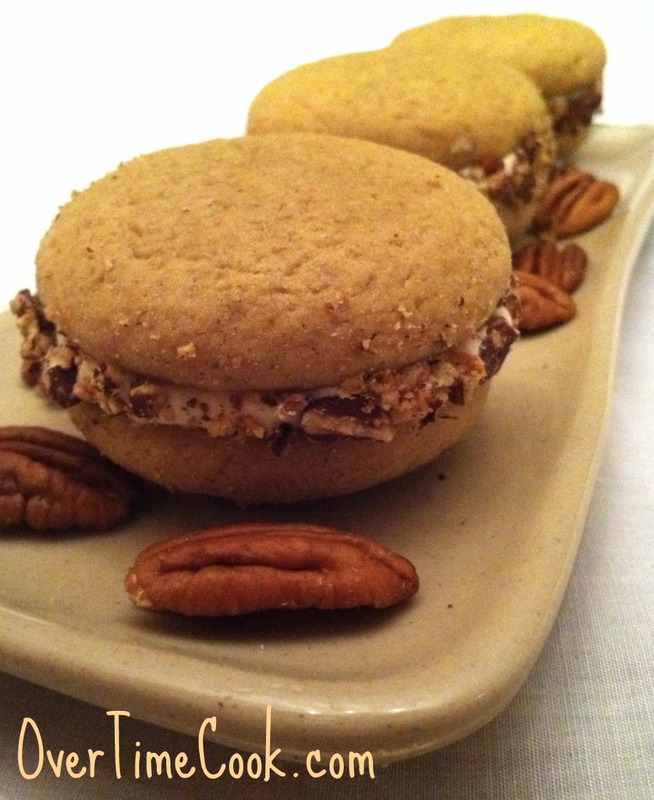 The toasted pecans really elevate this cookie into something absolutely sophisticated. And the best part…well, it’s a secret but I will let you in on it: these are way easier to make than their impressive appearance lets on. In the bowl of an electric mixer, cream together butter and sugar until combined. Add maple syrup, egg and vanilla, and beat until combined. In a separate bowl, whisk together the flour, baking soda and salt. Stir into wet ingredients until just combined, be careful not to overmix. Using a tablespoon cookie scoop, drop dough onto prepared trays. For the smooth look, as seen in the pictures, roll the dough between your palms to make a ball; for the rough look, just drop straight onto the trays. Flatten each cookie slightly with your palm. Bake at 350 for 10-11 minutes. 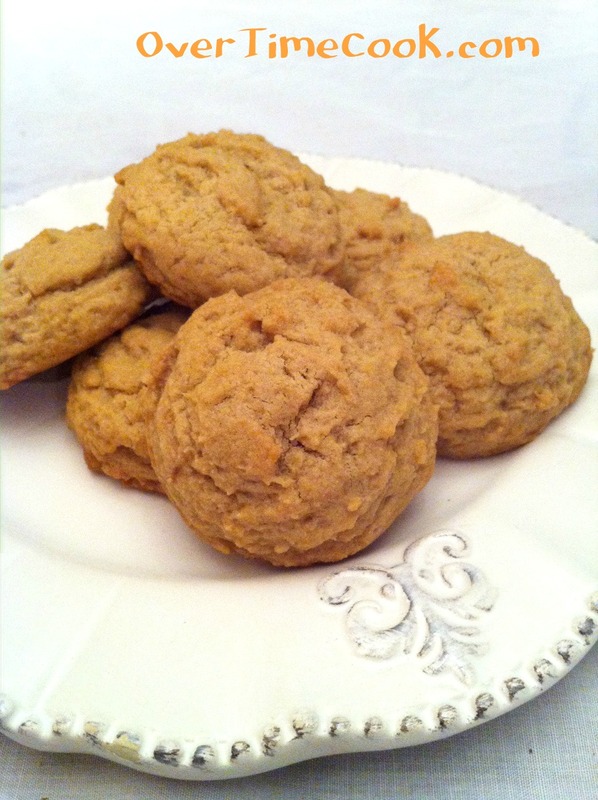 (For sandwich cookies, you may prefer smaller cookies. Drop the dough by 1/2 tablespoon or rounded teaspoon, and bake 8-10 minutes.) Leave cookies to cool on tray for one minute before removing to wire rack to cool completely. Do not make sandwich cookies until the cookies are fully cooled, or the frosting will melt. For frosting: beat the butter and maple syrup together until combined. Add the powdered sugar, one cup at a time, until fluffy. Add the milk, a bit at a time, to reach the desired consistency. For sandwich cookies, you want the filling to be quite stiff. Note: to toast pecans, spread on a tray and bake at 350 for 8-10 minutes. Check them frequently to ensure they don’t burn. Once toasted, they are easy to chop and can actually be chopped by banging them with a rolling pin. Oh, my kids LOVE when I make sandwich cookies! But somehow with double the cookies and a yummy icing middle, they disappear TOO fast! Yours look delish! These sound fabulous! Nice pictures, too. Impressive, indeed! Looks and sounds delicous! Great flavor for Fall! Wow, the look professional! Thanks for sharing. Love how twitter can affect real life in real time! Love the photography too. Miriam, your cookies turned out so beautiful. I LOVE sandwich cookies although I always seem to over frost and it comes squishing out the sides when you eat them.. oh well. I have been neglecting maple this fall, but it such a great flavor! Thinking about using it in something today… thanks for the inspiration and the mention! So glad you liked how they turned out! Great looking cookies, though I feel badly that you were awake and baking at 1:00 a.m. So neat that others were available and responded to your tweets. A delicious collaborative effort. LOL now that is a great story! Don’t you just love twitter!? And this is a great outcome… those sandwich cookies look delicious… I love Erin’s suggestion of rolling them in chopped toasted pecans! YUM! The pecans are a wonderful idea. It’s a good thing you had them in the house at 1:00 am! Looks delicious! What’s your Twitter ID? Thanks Hannah! It’s @overtimecook are you on twitter? Yum! These guys look sooo good. I want them… all! I love BHG recipes. Mhmm these cookies look so delicious! The sandwiched ones look almost like macarons (or maybe I’m just in the mood for macarons).